What is Summative Assessment and Why Does it Matter? You are here: Home / Blog / What is Summative Assessment? When most think of the word “assessment” they envision the large, high-stakes exams that caused stress and sleepless nights during time as a student. In actuality there are many different types of student evaluation—the most common form being summative assessment. While formative assessment is the evaluation of learning as it is taking place (assessment for learning), summative assessment is the practice of evaluating what a student has learned at the end of a given period of time (assessment of learning). As content is taught within a course, educators should evaluate how well the information is being absorbed and retained—this is where summative assessment becomes useful. By assessing students at the end of a module, course, or even entire program curriculum, summative assessment provides faculty insight into how well their students have mastered the delivered content..
As summative assessment is the evaluation of learning, assessments should be delivered at the end of the given period of teaching. Generally, summative assessments are an end-of-course or end-of-year exam; however, these are not the only applicable use of summative assessment. Evaluating students learning could come at the end of a chapter, learning module, or semester. Thus, summative assessments are not only high-stakes final exams, but can (and should) be viewed as a way to gauge, or spot-check, student mastery of a particular area of content. Most summative assessments are given with the understanding that the score given to the student will count towards their final grade. As such, keeping summative assessments secure from academic dishonesty is paramount to providing a fair experience for all test takers. Many educational institutions are moving to computer-based testing (CBT); however, testing on laptops or other devices can bring an entirely new list of security issues such as access to the internet or other applications during an exam. An effective way to ensure exam integrity for high-stakes summative assessments is to choose a testing software that does not utilize Wi-Fi during an exam and prevents students from accessing any other information within the device. The exam environment isn’t the only area of the summative assessment process that needs to remain secure—ensuring assessment items remain protected is also a concern. Once a test question has been compromised, it’s no longer a valid measurement of student learning. Thus, keeping questions secure in a password protected, cloud-based environment is vital. 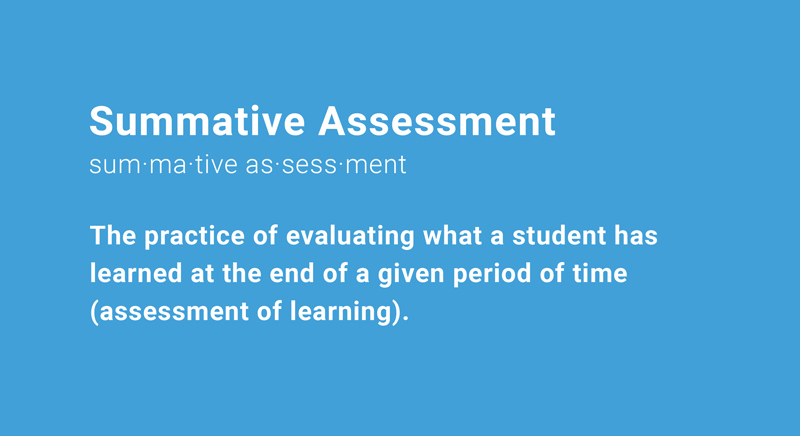 While the use of formative assessment hinges around providing students with feedback to help with the learning process, summative assessment happens after the student learning occurs. However, this doesn’t mean that communicating students’ performance to them is any less important. In order for students to understand what content they have mastered and which topics might need additional study time, they need detailed information on how they performed not only on the summative assessment as a whole, but also which specific topics they performed well on. This type of granular performance data can be gained by categorizing summative assessment questions. By tagging exam items to course topics or learning objectives, faculty can provide the detailed feedback students need to be more direct in how and what they study moving forward within the curriculum. Summative assessment is an important part of the assessment process and can be incredibly valuable to both students and faculty. By inserting summative assessment into key moments within the curriculum, ensuring that these high-stakes exams are secure and thus a valid measurement of student learning, then providing students with performance feedback, educators gain insight into how well their content is being learned and absorbed. Examsoft is a client-focused, computer-based testing company. Our end-to-end solution delivers robust item banking & analytics, control over your entire testing process, and the ability to test securely when and where you want.